This is a neat little story: The Magazine of Fantasy & Science Fiction has produced some fantastic covers over the years, and since the 1970s, they’ve included a little green alien on some of the covers. Over on their blog, they’ve gone back to look at why he was included. 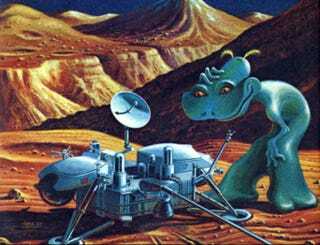 But in 1975, when public interest in NASA and space exploration seemed to be declining, David A. Hardy created an illustration to draw attention to NASA’s work and make space seem fun again. He named the alien Bhen (we’ll find out why in an interview with Bhen coming to the blog on Friday), and over the next 40 years the fun-loving big green alien appeared on a dozen F&SF covers, including the current November/December 2015 issue. The magazine has a gallery of other images from the lovable alien over on their website.